Placed 50th place on the list of the top 100 world-leading institutions for high-quality science. Recognized by Nature, the world's most highly cited interdisciplinary science journal. UNIST has climbed up world reputation rankings, according to the Nature Index 2016 Rising Stars supplement, published in the July 28 edition of the journal Nature. 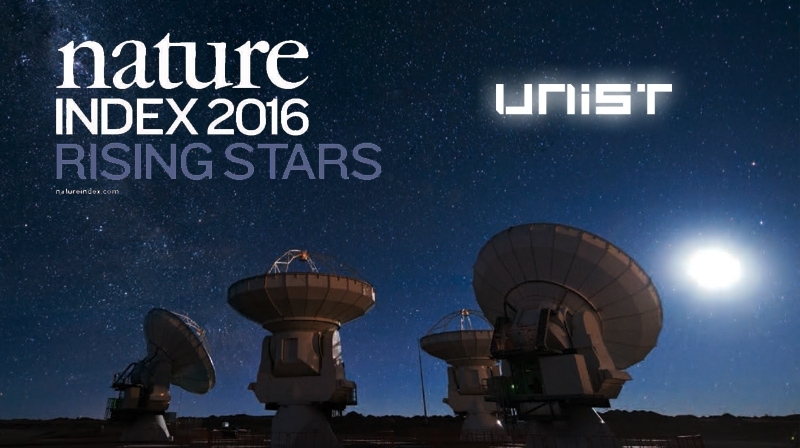 The Nature Index 2016 Rising Stars supplement identifies the countries and institutions showing the most significant growth in high-quality research publications, using the power of the Nature Index, which tracks the research of more than 8,000 global institutions. This supplement also presents a list of the top 100 most improved institutions in the index between 2012 and 2015, which are ranked by the increase in their contribution to 68 high-quality journals selected. In the index, UNIST has set itself apart from other academic institutions with its significant growth in research performance. With the meteoric rise of its contribution to top notch journals by over 180% in four years, UNIST placed the 50th place on the list of the top 100 world-leading institutions for high-quality science. Since 2012 UNIST’s contribution to the 68 journals included in the index, a metric known as weighted fractional count (WFC), has risen from 23.08 to 41.49, a more than 180% increase. Among the list of the top 100 most improved institutions across the globe, the top ranking 1 through 3 are from China, including Chinese Academy of Sciences (CAS), Peking University (PKU), and Nanjing University (NJU). Coming in at number 10 was University of Oxford. More information about the Nature Index, including its methodology and the list of 68 top academic journals surveyed, can be found HERE.